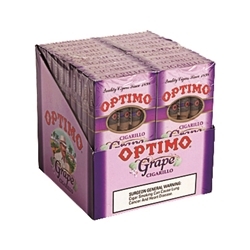 Optimo is a cigar brand from Swisher International Inc. Their Grape flavor Mini Cigarillo has already proven to be a favorite among customers. Carefully balanced blend of top-quality 100% natural filler tobaccos covered with prime natural leaf wrappers. Handmade in Jacksonville Florida, every popular Optimo cigar blend is highly regarded for its rich satisfying taste, mellow aroma, and very affordable price.